It was a slow first quarter, and March’s monthly deal results didn’t change that fact. Just 115 transactions were announced, following February’s total of 106. Compared with March 2018’s 149 deals, last month’s deal volume sank 23%. The over-heated market we saw in 2018 is cooling, at least momentarily. Of course, there was a time when seeing 115 deals in a month was unusual. Dare we say, exciting? But that was so five years ago, to be exact. In March 2014, there were 97 transactions made public, up just a sliver from the 95 announced in February 2014. With the exception of August 2014 (another slow month with 95 deals), monthly deal volume has stayed above the 100-mark ever since. Even with the slowdown, there were a couple of standouts. 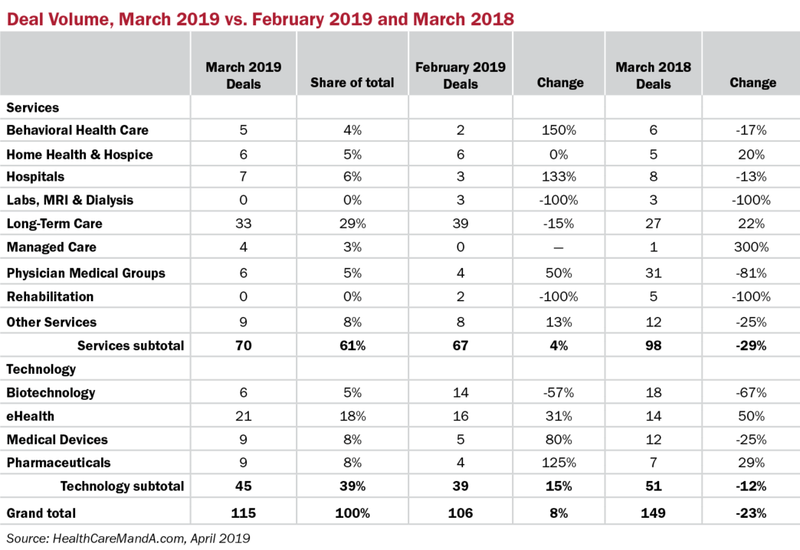 The two best performing sectors in March 2019 were Long-Term Care with 33 deals (29% share for the month) and eHealth with 21 deals (18% share). Long-Term Care, which covers seniors housing as well as skilled nursing facilities, is the monthly winner when it comes to deal volume. The skilled nursing side has experienced some headwinds in recent years, while seniors housing has seen strong demand for independent and assisted living communities. Spending for the month amounted to less than $500 million total, however. Many of the top-tier properties are off market and the bulk of the deals are done among regional or local owners and operators. No matter, it’s still a healthy market. Digital health deal announcements have mostly stayed in the 15-to-20 range in recent months. As fragmented as this market is, between electronic health records, artificial intelligence-driven data analysis and telehealth, consolidation among startups is rivaled by acquisitions from outside the sector, such as hospitals, managed care organizations, physician practice management companies and home health agencies. Another trend we’re seeing is the shift away from services’ deals, tipping back to the technology sectors. In March 2019, services transactions accounted for 61% of the deal volume. A year earlier, services held 66%. 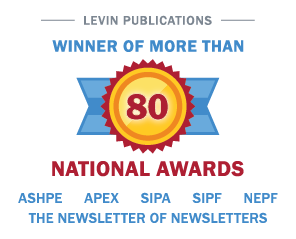 It isn’t just the year-over-year results we’re noticing, however. Pharmaceutical deals are beginning to flourish again, along with the occasional bump in the Medical Device and Biotechnology sectors. This was the norm back in years up to 2016, and we may be revisiting that scenario.